While we wait for spring vegetables to appear, we’ve been eating lots of root vegetables. Root vegetables have sustained mankind through millennia of winters, because they last for long periods in cool temperatures. Before the advent of modern refrigeration, root cellars provided vital cold storage that kept a family fed through the winter. Growing underground (photo #1), the root are generally storage organs, enlarged to store energy in the form of carbohydrates. These large roots are eaten as vegetables. Root vegetables are plant roots eaten as vegetables (photo #2). Beet, carrot, parsnip, potato and sweet potato, radish, and turnip are widely consumed in the U.S. Some roots, such as galangal, ginger, horseradish, turmeric and wasabi, are used for condiments or seasonings. Arrowroot is used as a thickener. Gingseng is used medicinally. To give you a perspective on the category, here’s a categorization of the root vegetables more familiar in the U.S.
Taproots: beetroot (beet), burdock, carrot, celeriac (celery root), daikon, dandelion, jicama, parsley root*, parsnip, radish, rutabaga, salsify and turnip, and others not well-known in the U.S.
Tuberous roots: cassava/yuca/manioc, Chinese/Korean yam, and sweet potato, among others. Bulbs: fennel; garlic, green onion/scallion, leek, onion, shallot and the rest of the Allium family. Corms: Chinese water chestnut, taro. Tubers: Chinese artichoke/crosne, Jerusalem artichoke (sunchoke), potato, ube, yam. Roasted taproots and tubers are popular roasted vegetables in American cuisine. Even people who fuss over eating vegetables enjoy the sweetness of the sugars that come out during roasting. There are endless recipes, of course; but here are two recipes from Idaho Potatoes with some added glamour. We like the convenience of this recipe. Root vegetables are hardy, and can keep for a few weeks. It’s easy to pick up a rotisserie chicken if you don’t have time or inclination to roast one. You can use substitute other root vegetables, or create a grain bowl with a bottom layer of a favorite grain. 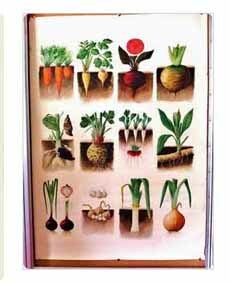 An old illustration showing how root vegetables grow (photo courtesy Etsy). 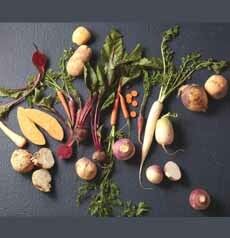 Harvested root vegetables (photo courtesy DIY Naturals). 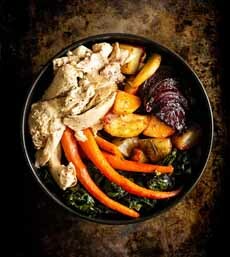 Recipe #1: roasted root vegetables with chicken (photo courtesy Idaho Potatoes). 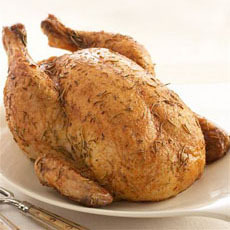 Rotisserie chicken (photo courtesy McCormick). 1. PREHEAT the oven to 425°F. Line a baking sheet with foil and spray with cooking spray. 3. HEAT the remaining olive oil in a skillet over medium-heat. Sauté the Swiss chard with the chopped garlic, until wilted, about 10 minutes. Season with salt and pepper to taste. 4. MAKE the aïoli: Whisk the mayonnaise with the maple syrup and cinnamon until combined. Spoon into a serving dish. 5. DIVIDE the chard evenly in serving bowls. Top with the roasted vegetables and chicken. Serve with the maple aïoli on the side for dipping. *Parsley root is not related to parsley, the herb, but is a beige root vegetable that resembles a parsnip or turnip. The edible leaves that grow above the ground do resemble curly parsley leaves, but taste like celery. Parsley root is also called turnip-rooted parsley. In Germany it is known as Hamburg parsley, and is a popular winter vegetable in Germany, Holland and Poland. 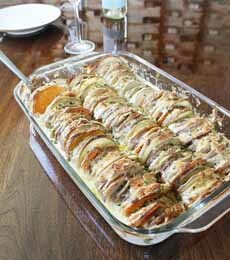 A three-potato gratin with turnips (photo courtesy Idaho Potatoes). 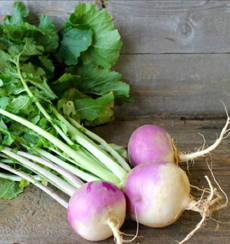 Turnips (photo courtesy Good Eggs). 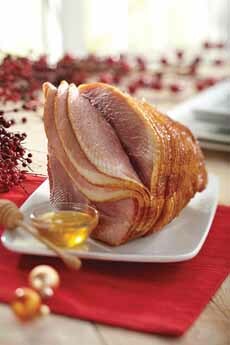 We served the casserole with a beautiful Smithfield spiral-cut ham (photo courtesy Smithfield). This casserole reminds us of a tian, a beautiful way to serve summer vegetables. It is actually a gratin†. This recipe serves a trio of potatoes plus turnips under a cloak of melted cheese. They work together in this recipe because they can be sliced into roughly the same sizes, which cook evenly. 1. PREHEAT the oven to 400°F. Slice the potatoes and turnips and set aside in a large bowl. 2. HEAT 1/2 tablespoon butter over medium heat in a medium, non-stick skillet. Add the onions and garlic; sauté until translucent. 3. ADD the cream cheese, heavy cream, salt and pepper. Bring to a simmer and stir until smooth. Turn off the heat. 4. SPRAY a 9″ x 13″ baking pan with non-stick cooking spray. Place half of the potatoes and turnips in a separate large bowl. Slowly add 1/3 of the cream mixture into the bowl with the potatoes and turnips and mix to coat well. 6. POUR the remainder of cream mixture into the baking pan. Cover the pan with aluminum foil and place in the oven for 30 minutes. After 30 minutes remove the foil and bake for an additional 40 minutes. 7. REMOVE from the oven, sprinkle on the parmesan cheese and bake for an additional 15-20 minutes. Garnish with the chives right before serving. We liked the recipe so much, we’re making it again today! Gratin (grah-TAN) is a method of food preparation in which a protein, vegetable or starch is served with a browned crust of grated cheese. The crust may also include breadcrumbs, egg and/or butter. Gratin originated in France and is usually made in a shallow baking dish. The main ingredient can be baked (roasted) in the oven or cooked on the stove top. In the latter case, the toppings are then added and the dish is finished in the oven or broiler. The baking dish is usually brought to the table piping hot. It’s a perennial favorite: Who doesn’t like their food topped with melted cheese?